Here’s a little secret: You do not need to hate on Times Square to be a true New Yorker. Sure, it’s crowded, loud, and kind of lame, but this glitzy pocket of Midtown is really just a neighborhood like any other, where people eat, drink, work, and believe it or not, actually do live. We all occasionally find ourselves in Times Square for one reason or another -- whether we’re showing out of towners around, checking out a Broadway show, or trying to relive TRL’s glory days by hanging around the MTV studio (Carson Daly, where you at?). 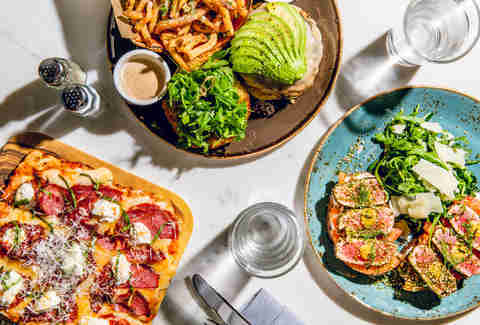 And, fortunately, for every price-hiked chain restaurant, there are some pretty great spots to grab a quick bite, tasty cocktail, or decadent meal. 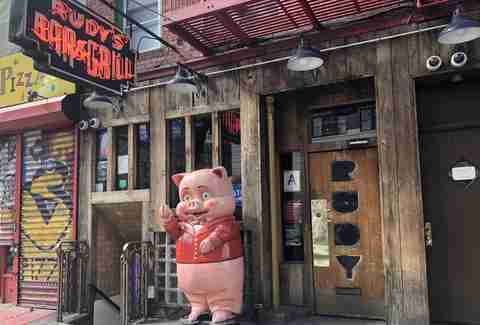 So next time you find yourself blinded by the billboards, rather than ducking into the closest subway entrance, get over yourself, take a damn selfie, and head to one of the Times Square area’s best restaurants. Pizza is always a good idea, especially in Times Square, where you may be aiming to spend as little time as possible. But the area has more bad options than good ones, so you must choose wisely. Joe’s is a New York institution and a solid option nearly ‘round the clock (It’s open until 3:30am). Order a slice to stay and check out the photo wall of A-list celebrities who have visited one of joint’s four NYC locations -- the best one is definitely the blurry cell phone shot a guy behind the counter took of Drake. Cheese slices go for $3; toppings will run you a buck or two more. If there’s been a pastrami-sized hole in your heart since the closure of the iconic Carnegie Deli, Pastrami Queen is here to fill the void. 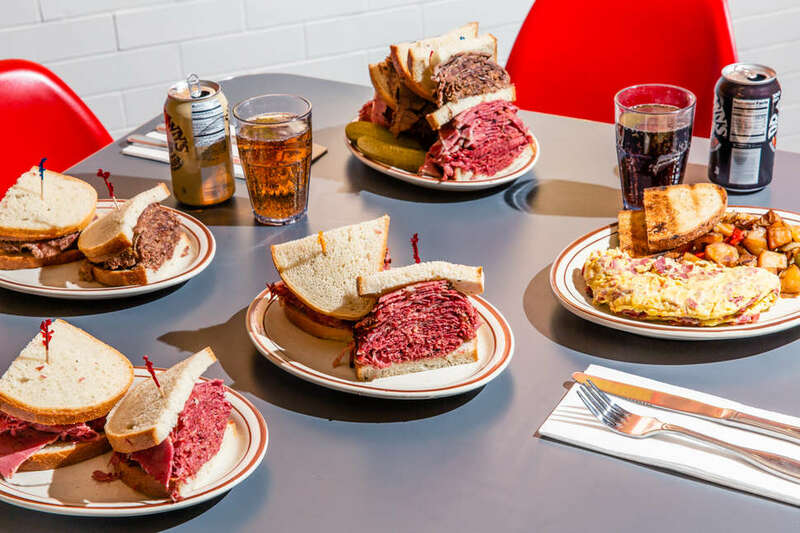 This kosher deli and diner has been preparing original recipes of what the team calls “Jewish soul food” since 1956, and just opened a second location in Times Square this month. 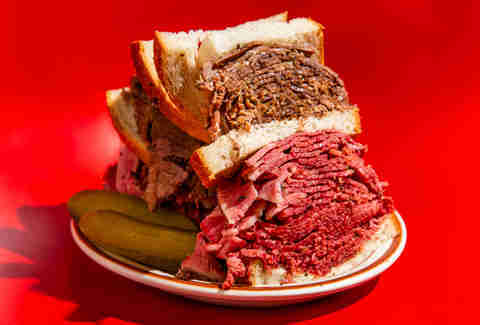 Latkes, matzo balls, knishes, blintzes, and of course, bangin’ pastrami are will fill your belly and warm your heart. When Xi’an Famous Foods first opened in 2005, it was a 200 square foot stall in the basement of a shopping mall in Flushing. 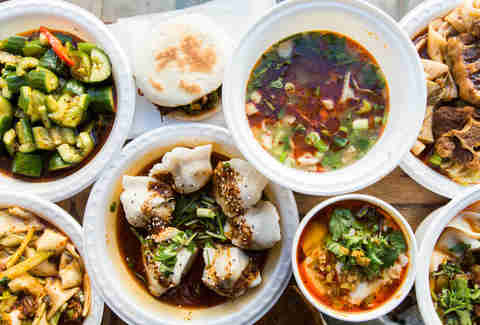 A visit from Anthony Bourdain helped put the immigrant family-owned business on the map, and nearly 15 years later, Xi’an has 15 locations around the city and is the go-to spot for fast, Western Chinese cuisine. There’s not a bad dish on the menu, but if it’s your first visit start with the hand-ripped noodles. Warning: these dishes bring the heat, so prepare to sweat and love every second. The kati roll is accessible even to folks who may not have tried Indian food before. 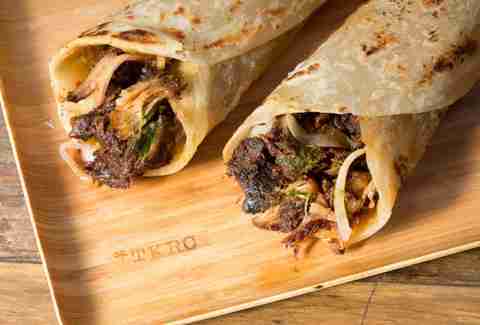 Buttery paratha or roasted whole wheat roti is filled with meat and veggies bolstered by a blend of nearly 30 spices. The most popular roll is the chicken tikka, and plenty of vegetarian and vegan options are available, too. 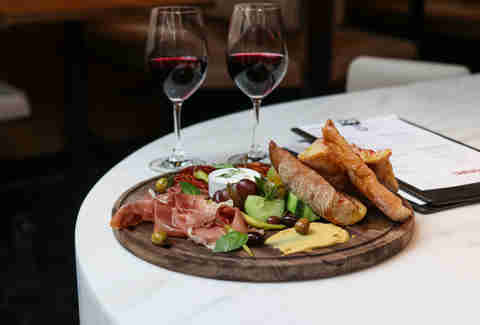 This recently opened restaurant is a cool and relaxing place to dine amid the hustle and bustle of nearby Times Square. The art deco decor is reminiscent of old school New York, and has you feeling like you’re dining inside a ballroom at the Chrysler Building rather than a couple blocks from the jumbotron. The bartenders are gin experts, and have a full menu dedicated to customized gin & tonics. Depending on your selections, prices range from $13 to $22, which can be dangerous, because you’ll want to try all of them. Hakkasan New York would be considered unbelievably chic anywhere in the world -- quite a feat considering its proximity to Port Authority, aka where dreams go to die. Ornate decor, sultry incense, and, of course, the fantastic food offer a full sensory experience. 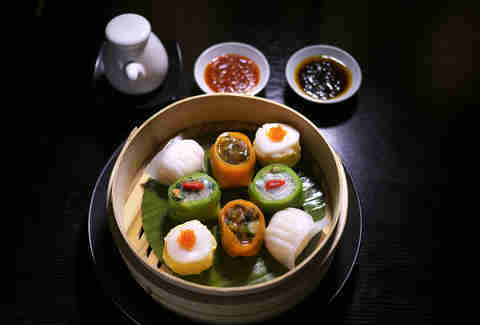 The dim sum lunch ($42 per person) is a feast, and pairs well with expansive tea and cocktail menus. 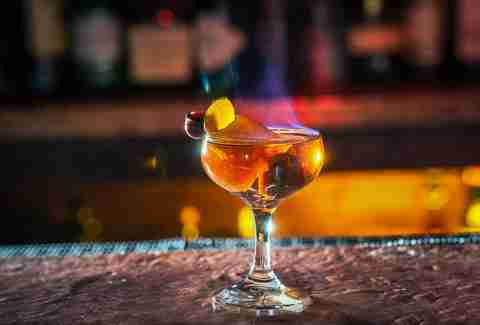 Just a stone’s throw away from the Red Steps, this is one of the best spots in the five boroughs for a rum cocktail. You can catch live piano and jazz music nightly, and the bartenders specialize in crafting original cocktails based on your spirit and flavor preferences. The dim lighting and old fashioned copper and wood decor make you lose track of the time -- and even what year it is -- in the best way possible. We’ve heard the strength of the drinks also help with that. Flights from New York to Spain may be cheaper now than ever before, but not as much as the $2.75 MetroCard swipe it takes you to get the same quality and authenticity of food at Boqueria. Your absolute must order is the Jamón ibérico (Iberian ham); hand-carved from acorn-fed black Iberian pigs and aged for 30 months, it melts like butter in your mouth and is absolutely worth the $32 price tag. The New York power lunch is a real, real thing. *Insert Matthew McConaughey chest thumping here. * The moment your boss entrusts you with the corporate card, take your clients and/or work BFF to indulge in Mastro’s rich steaks and signature iced seafood tower. You have to spend money to make money, as they say; that money might as well be spent on amazing food. Your rivals will be affectionately calling you the Mountain Lion of Midtown before too long. What if we told you that you could get dinner (well, “dinner”) AND a drink for a total of $3, just around the corner from Times Square? THIS IS A REAL THING AND IT IS MARVELOUS. And only a tiny bit sketchy. Rudy’s, which is perhaps the most hilarious and wonderful dive bar in New York City, sells 16 oz. draft pints for $3, and each purchase gets you a free hot dog. Neither are very good, but for $3, do you even care? I consumed an embarrassing amount of them throughout my youth (and maybe as recently as a few months ago) and I’m still here to tell the tale, so you’ve got nothing to lose. Jenny Hart is a Thrillist contributor.